The third member of the catur-vyūha, Pradyumna, took part in Radha Madhava’s lila in Vraja as Krishna’s intimate friend or priya-narma-sakhā. He has now appeared as Raghunandan, whose body is not different from that of Śrī Chaitanya. Raghunandan was born into a family of physicians in the Shaka year 1432 (1511 AD). His father’s name was Mukunda Das, his mother’s name is unknown. Mukunda Das was Narahari Sarkar Ṭhākura’s older brother. In the fifteenth chapter of the Madhya-līlā of Chaitanya Charitamrita, it is clearly said that Mukunda Das was physician to the king. Externally, he appears to be engaged in government service as physician to the king. But in his inner life, he is filled with divine love. Who can know the extent of his love? Once when Mukunda Das was engaged in treating the king, he saw a peacock feather and fainted. This incident is also described in the Chaitanya Charitamrita (2.15.121). On the Burdwan-Katwa rail line, Sripat Srikhanda station comes first, and then the Srikhanda. Mukunda Das’s home is about one mile from the Srikhanda station. Raghunandan Ṭhākura took birth on the Vasanta Panchami day. His uncle Narahari took a great deal of interest in raising Raghunandan, for whom he had much affection. 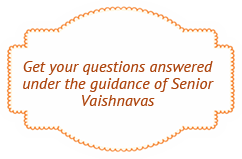 Chaitanya Mahāprabhu indicated that one’s seniority depends on the depth of devotion, by telling Mukunda Das’ son to be really his father. 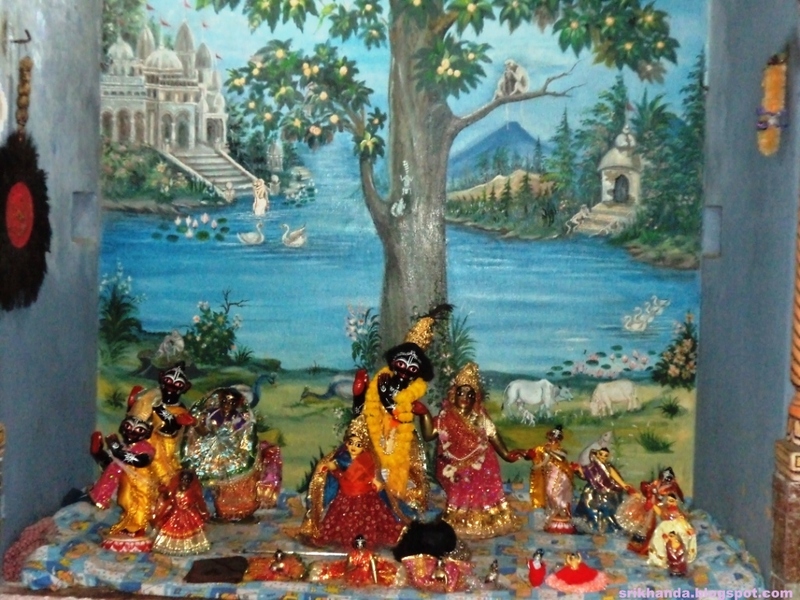 Mahaprabhu gave Raghunandan the service of deity worship. He constantly engaged in the service of Sri Krishna. He had no other intentions. Mukunda Das lived in the village of Srikhanda, with his household deity Gopinath. One day he had to go somewhere for work and he called Raghunandan to do the service. Mukunda was so astonished at his child’s wondrous words that he asked him to make another offering. This time after he left the house, he returned and hid to watch what his son did. Raghunandan joyfully placed a laḍḍu in Krishna’s hand and said in a commanding voice, “Eat! Eat!” When Krishna had eaten half of the laddu, Mukunda Das came in the doorway. Mukunda saw that Krishna did not take another bite and that the half-eaten laddu remained in His hand. This caused him to be filled with love. He embraced his child and as tears of joy rained from his eyes, spoke to him in a broken voice. Narahari Sarkar Ṭhākura gave honey to Nityananda Prabhu and Mahāprabhu from a pond right next to the home. This pond became known as Madhu Pushkarini. The legend is told that a kadamba tree which grew right next to this pond always had two flowers blooming regardless of the season by Raghunandan’s miraculous powers. According to the Gauḍīya Vaiṣṇava Abhidhāna, another miraculous event took place in Raghunandan’s life: One day Abhirama Ṭhākura came to Srikhanda and paid his obeisances to Raghunandan. Then he embraced him and melted with feelings of prema. Raghunandan started to dance and sing kirtan, and while doing so, one of his ankle bells slipped from his foot and went flying off, landing four miles away in Akai Hat near his disciple Krishna Das’s house. Later, in order to commemorate the event, a tank was excavated in that village and given the name Nupur Kund. Mahāprabhu, the father of sankirtan, gave His adopted son Raghunandan Ṭhākura the authority to offer the garland on the day before the sankirtan yajna (the adhivāsa) and to make the final offering at the yajna’s end. Raghunandan Ṭhākura accompanied the Bengali devotees to Puri every year during the cāturmāsya. He would dance with his uncle Narahari at the Rathayatra festival in the group formed by the residents of Srikhanda. He participated in the Kheturi festival organized by Narottam Das Ṭhākura, at Gadadhar Das’ festival in Katwa and at the commemorative festival for Narahari Sarkar Ṭhākura in Srikhanda. Once our Lord Krishna Chaitanya and His companion Nityananda Prabhu have completed their pastimes in the material world, the Vaiṣṇavas in this age of Kali will become more anxious with every passing day. Whether very advanced, somewhat advanced or neophyte, their hearts will nearly always be filled with doubt. But don’t let this worry you. Lord Gauranga will accomplish many great works through you. I bless you that you remain long on this earth and that you and your followers protect our Lord’s religion. Those who are opposed to devotion to Krishna will become devotees by your influence and they will take shelter of you. Raghunandan slowly became hidden to mortal eyes while repeating the names of Śrī Krishna Chaitanya again and again. How glorious is that day of Shravan śuklā caturthī! Will anyone not sing the glories of Raghunandan Ṭhākura?